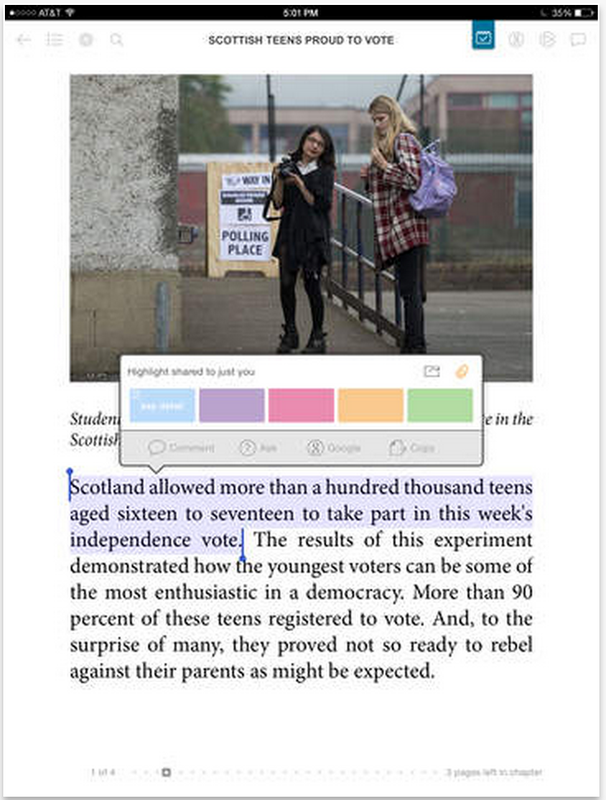 Subtext is an excellent iPad app for enhancing students reading skills through engaging them in a variety of interactive and collaborative digital reading experiences.As a teacher, you can import any kind of text to Subtext (e.g online article, eBook, PDF document…etc) and customize it the way you want before using it in class. For instance, you can highlight selected portions in a text, annotate it, add your comments or embed links to external resources you want your students to check. You can also create polls and add different kinds of questions to engage your students in the reading process. • “Create Private Groups: to make it easy to share content with students, keep discussions closed and differentiate instruction. Archive groups to stay organized, without losing notes. • Embed Discussions: to help students engage with their reading. • Find Content: using our in-app book search or clip articles from the web with ‘Save to Subtext’. • Login Quickly: through top social networks and Renaissance Learning (™) accounts. • Read on Carts: to easily share devices while keeping student work separated. • Stay on Task: double finger tap on a page to get students to the same page instantly. • Read Offline: view and add discussions without internet access, they’ll sync when you connect. • Restrict Students: if desired, limit student access to the web, content, messages and groups. • Text to Speech: Listen to a single word, a passage or a whole page at your desired playback speed. Supports ELL, struggling and younger readers. • Common Core Assignments for any Book or Article: Over 50 templates sortable by text type, grade, and standard. Choose a template (i.e. ‘Making Inferences’), then use our suggested tagging and writing activities or add your own. • Common Core Assignment Dashboard: Monitor students’ progress by CCSS standard in all the assignments in your group. Fill gaps in your instruction with Suggested assignments and articles from our curriculum team and other educators.